I found this article in a Cup of Jo blog post and was so touched and inspired by it I wanted to share. It’s written by a man who was struggling to finish a novel and started having horrible panic attacks. ("Seven years into writing a novel, I started to lose my mind," he wrote.) To make himself feel better—and get out of his own mind—he did something counter intuitive: He started praying for other people. Sitting on the bench by the river that day, I remembered having read in Reader’s Digest—a periodical my family has undue reverence for—that when you are feeling bad, one way to make yourself feel better is to pray for others. I began to pray for the people who were passing by. I prayed for the nanny pushing a stroller. I prayed for the young woman jogging by in spandex. I prayed for the little boy pedaling his bicycle. I prayed that each of them got the same things that I wanted for myself: that they have good health, peace of mind, financial security. By focusing on others and their needs, my own problems seemed less unique and, somehow, less pressing. ...I called my parents a few weeks ago on the second anniversary of my brother’s death. My father began telling me that he felt abandoned by my brother, that my brother’s dying feels like him leaving us. As he spoke, I started thinking: I love you. I love you. My usual response at this point would have been to tell my father that he needed to focus on the future, that what was past was past. Instead I told my father that he was wonderful, that he should think of how brave he had been to take care of his poor sick son for all those years, that his devotion had been heroic. However odd my reasons may seem, I am glad that I said this. I love people watching and am going to try and pray more for the people I see each day, and now that sweet Aretha song is stuck in my head! I say a little prayer for you. *I didn't have any images of people praying but I did have a picture of superheros. 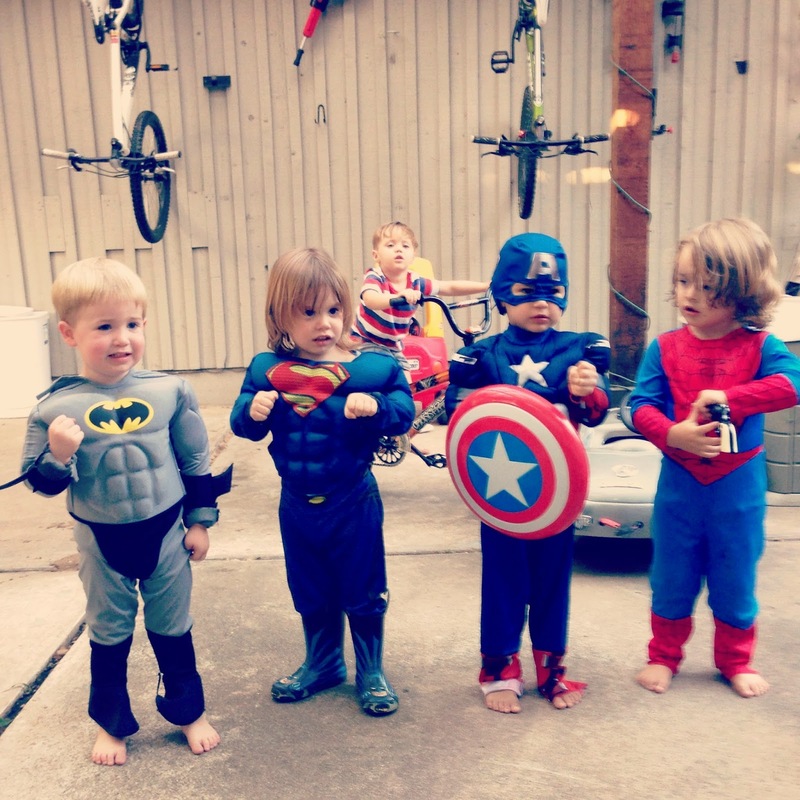 And these little superhero's are answered prayers for a few of my favorite mommas. I love this! Thanks, Stharah! Love you.